Young voters on education and farming Jump to media player Two members of the BBC Wales Generation 2016 panel of young votes share their views on the issues that matter to them. What is at stake for first time voters? Jump to media player Confused about the Welsh Assembly elections? BBC Wales teams up with BBC Newsbeat's Steffan Powell to decode devolution. On 5 May, the people of Wales go to the polls to choose 60 members to form the next assembly. For some, this will be the first time they've voted in an election. 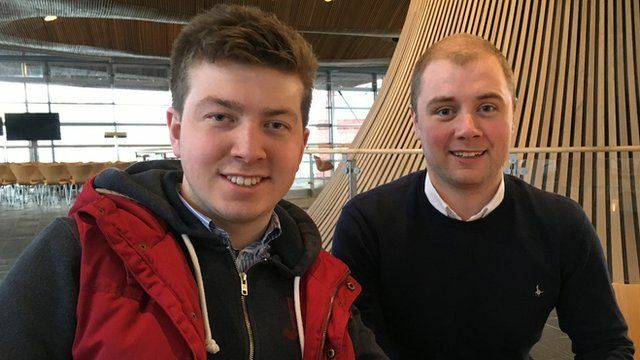 Theo Davies-Lewis, from Llanelli, and Greg Thomas, from Builth Wells, are two members of the BBC Wales Generation 2016 panel of young voters. They share their views on the issues that matter to them. Go to next video: What is at stake for first time voters?